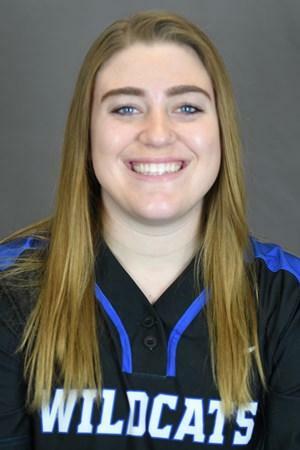 WILLIAMSPORT, Pa. – Penn College won its sixth-straight game with a doubleheader sweep of Keystone College in a non-conference softball game Sunday. The Wildcats improved to 6-4, while the Giants fell to 4-6. Elizabeth Asher totaled four hits on the day and reached 100 hits in her career. Keystone took an early 1-0 lead before Penn College regained the lead for good with two runs in the bottom of the first on Kylie Shreiner's two-run single to right field. Chelsea Gray's double and Shreiner's sacrifice fly in the third gave PCT a 4-0 lead before Olivia Hemstock brought in a run in the fourth, Gray smacked a two-run single, and a passed ball put the Wildcats ahead, 8-1. Penn College end the contest in the fifth when Gray's fourth RBI of game invoked the eight-run rule. Gray and Hemstock both finished with three hits for Penn College and Asher picked up a pair. Kyla Benner improved to 4-1 after five innings in the circle, with two strikeouts, two walker and one earned run on three hits. Penn College jumped out to a 3-0 lead when Taylor Brooks plated Hemstock with a sacrifice fly to left and Jessica Brooks roped a two-run triple to left field. Keystone made it a one-run game with two in the third but the Wildcats quickly responded. Taylor Brooks brought in a run with a single to center in the third and she belted another single to center in the fifth to bring home Gray and make it 5-2. Maddie Wenk and Shreiner followed with RBI singles in the fifth give Penn College a 7-2 advantage. Gray and Asher both finished with three hits for the Wildcats, while Taylor Brooks picked up two hits. Morgan Heritage (Hodgson) improved to 3-2 after a complete-game effort. She allowed two runs on eight hits, with 12 strikeouts and one walk. Penn College returns to action Saturday, 1 p.m., hosting Penn State Berks.